Deans, December 4th 2018, passed away peacefully at Altnagelvin Hospital, Margaret, 32 Bells Hill, Limavady. Much loved wife of Roy, loving mother of Cheryl, Malcolm, Lindley, Maxine and Naomi. Dear mother in law of Garth, Helen, Ian, Rod, devoted grandmother of Steven, Warren, Emma, Amy, Calum, Alex and Lynn. Funeral service Drumachose Presbyterian church on Friday at 12noon followed by interment in adjoining church yard. 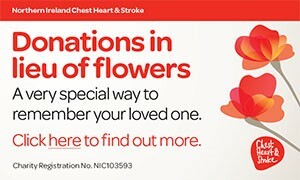 Family flowers only please, donations if desired and cheques payable to Drumachose Presbyterian C/O Browns Funeral Directors, 25 Church Street, Limavady. Will be lovingly remembered and sadly missed by her entire entire family circle. I am sorry to tell you that Margaret Deans has passed away.